Dr. Gregory Knudson provides general radiology services for physicians and specialists, embracing new technologies that will improve the quality and accuracy of diagnostic procedures for evaluating a variety of conditions. Dr. Knudson is one of seven physicians at Radiology Associates of Appleton who perform Positron Emission Tomography (PET) imaging. PET is often more sensitive than conventional diagnostic imaging, distinguishing tumors as cancerous or noncancerous and detecting cancer that has spread to other areas of the body. Dr. Knudson received his medical degree from the University of North Dakota. He completed his radiology residency at the University of Texas Southwestern. He also completed a fellowship in digital imaging at the Medical College of Wisconsin. Dr Knudson has served in various capacities in his tenure with Radiology Associates, including prior section chief and board member. 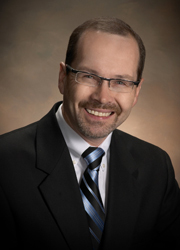 Dr. Knudson joined Radiology Associates in 1989 and is board certified by the American College of Radiology. He is a member of the Radiological Society of North America, the American Roentgen Ray Society, the American College of Radiology and Alpha Omega Alpha.